Hi there friends, reality conspired yesterday. My computer would not crunch through the video and even though my voice is back, I still wasn’t feeling up to par. I’ve learned, everything doesn’t happen in my time, so I let go. Today is another day and I have a new little hero to introduce :-) I hope you enjoy the video and I hope it will make you brave enough to try the things you think you cannot do. You can let them air dry. You can use a heat gun. **Disclaimer – Use oven at your own risk, never leave oven unattended, not appropriate for unattended children. It’s no coincidence that I’m pulling a spring look in my cards – I adore spring and get one of my greatest inspiration pushes right after winter when the relentless teasing of spring begins. I give in and start to think about the holidays and occasions coming up. Mothers Day is high on the list and we have two months to consider what we’ll make! I’m sharing a card with some of my favorite older templates – Spellbinders Enchanted Labels Twenty Eight, Spellbinders Elegant Labels Four, Spellbinders Classic Ovals SM, Spellbinders Classic Ovals LG, Spellbinders Back to Basics Tags. If you are new to my blog, I love to create hinged cards that have the same shape on the front as on the back – this is an often asked question so if you are curious, I have a tutorial —–> HERE. In the mean time, today is Day of Giving Friday Saturday (we’ll be back to Friday next week). If you’re not familiar with Day of Giving Friday, every Friday I give away a card to a reader who leaves a comment – here’s a link to my FAQ’s just check out #11. For your comment today – What is your sure sign signal that spring has arrived? What does it inspire you to do? Thanks for stopping by today – what do you think of my hero? Dig in your stash and give it a try!! 70 deg. temperatures, daffodils are in bloom and mowing the grass besides starting to plant veggie seeds. I am feeling the spring today in Oklahoma. It is to be 74 degrees today. Hubby and I sat on our porch to eat lunch and he also had grilled the meat. I found one daffodil peeking out calling “spring” to me! I think your Hero is just Fantastic Becca, thank you for the Video and Tutorial. We have Snowdrops in the garden and the daffodils are in bud. Wonderful video if a bit disappointing as I don’t have the machine or dies (and they aren’t in the budget right now). BUT I see the idea working with other flower petal dies!! Beautiful card, as always. I love hinged cards but sometimes, it’s difficult to get the die to cut through two layers! Signs of Spring are the daffodils blooming and because of our mild weather lately, they have come up early, then we get a frost, so confusing everyone, including the spring flowers! With the weather warming up, it means we can leave that extra layer off when walking along the beach and enjoying the fresh air. Thank you for this great tip. I have been making more paper flowers. I have made a small bridal bouquet for my niece’s shower and and an arrangement in a crystal compote for another niece. I have such fun and your tip just gives me another choice for variation. Beautiful work, as usual. Thanks for pasting. The springtime signal for me is when the daffodils, hyacinths and muscari appear in my garden. They have been there for many many years as a chapel once stood where my house is now. When clearing the garden we found a wall left when the chapel was demolished. We were very lucky to find photos of the old chapel and we now have them hanging on the wall in our home. Wow, I never thought to use my measuring spoons. I’m going to look through my utensil drawer for other “heroes”. Great video. For me a sign that spring is coming is when the Phillies go to Clearwater, Florida for Spring Training. Play Ball!!! When we lived in West Texas, a sure sign of Spring was the mesquite tree budding out. OH, the SUN, the SUN! Spring comes to my house with green Hyacinth petals peeking above the dirt..the SUN is so welcome here in New Jersey. The snow may still be present, but can be overlooked when the hint of the dogwood buds begin to swell. Spring will be late this year, but much anticipated. 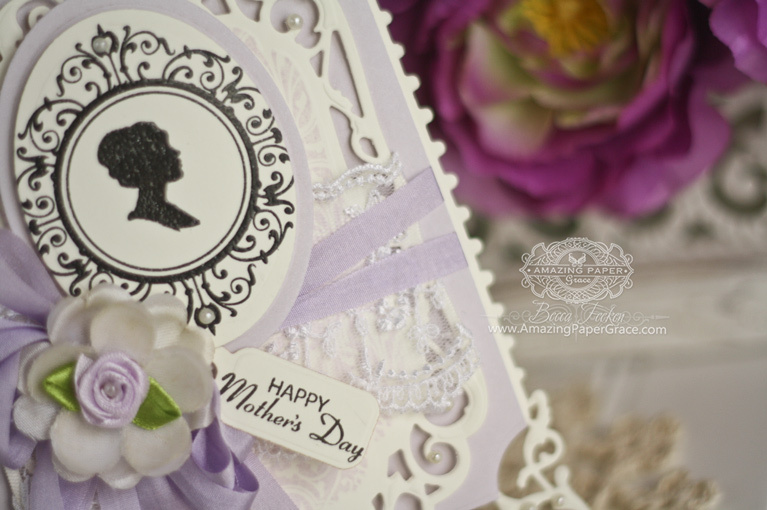 Your beautiful hinged card is so delicate and perfect for a Mom. Lovely project Becca….as always, you do such a wonderful job! All the daffodils in their bright yellow finery are blooming – definitely makes me want to COLOR!!!! The birds are back and I try to “fly” around and try your ideas. Beautiful card today and wonderful video. What a great and easy way to mould the flowers. I know spring is here when it’s time to mow the lawn, which will probably be in a month or two’s time! In the north of England we only have snowdrops and crocuses blooming and it’s been very cold today. The lovely time when the crocuses and daffodils begin to show their little heads – ahhhh, Spring really is on its way!!! That’s also when it begins to be lighter for longer every day. What a combination of joy and hope! Beautiful card! To me, Spring has Sprung when I see daffodils growing! Today is Feb. 27th of course – but I haven’t seen any daffodils yet! I don’t know if I just haven’t been driving in areas where they are planted or grow wild or if Spring hasn’t arrived here in South Louisiana yet! We have had an extremely mild Winter but it has been in the 30s at night the last week! So I guess Winter is still pushing back on Spring! I watched the video on hinged cards and will be using your suggestions. I tend to make 4.25″ x 5.5″ cards just to be economical as I’m retired but I do love your larger cards! It just occurred to me that for special occasions, i.e., birthdays, I could make larger cards, and stick with the smaller ones when I have bunches of cards to make, i.e., Christmas, other holidays. What a gorgeous spring card!! The lavender is beautiful. Definitely inspiring me to get some spring cards made! I’m glad you’re feeling better. Winter has not been kind to me, either. But on to spring!! Your video was very helpful! Thank you very much for sharing with your faithful followers how you make your gorgeous creations. Oh Becca what a wonderful question ~ for me it’s the tops of my crocus, daffodils and tulips just popping up through the ground to find some sunshine. It inspires me to get out start walking and enjoy the fresh air! What a lovely card! Love your bow, flower and the sweet wee Pearl accents! My first sign that spring is sprung: my wisteria & a few other plants burst out with little green pops, my peach tree looks like it is a mini tree of pink blossoms with no leaves. It then makes me purchase wild flower seeds and sweet pea seeds and get them into the ground ASAP. Color…after a long drab winter, the tinge of green as the grass starts growing and the flowers start pushing out of the ground! Good morning Becca, what a fab technique this card is stunning!!! Anyone would be delighted to receive this!!! Spring is here when the nights start drawing out, the daffodils, crocus, snowdrops and bluebells appear!!! The first signs of colour in the garden it’s like a breath of fresh air!!! Hi Becca, thank you for sharing the tutorial. What a clever short cut! The first sign that spring is coming is the longer days & that warm sun in the morning. It inspires me to be more active in the outdoors & just appreciate all of God’s creations of nature all around us! Love, love LOVE this card, Rebecca, and I’m glad you are both feeling better and that you took the extra day to rest your voice. I will be watching the video a little later…and looking forward to meeting your new little hero. Oops! First signs of spring…forsythia out…means it is time to prune the roses and get busy doing the spring cleanup in the garden beds, get ready for planting! Sure sign of spring in my garden is the peach trees blooming, just as the oranges are ripening. Hi Becca, well worth the extra day wait it gorgeous, I feel Spring has arrived when the Crocus and daffs appear but our weather in Scotland has been so funny this year they were all up in January flowers not open yet but there little heads are there. Another beauty Becca! Spring is not such a marked change from winter here in the Antipodes, but when I see the Daphne in bud I know the seasons are definitely changing, and it inspires me to dig my vegetable garden!! they jump around and play with such energy . This card is gorgeous ( nice if you have a Mum like yours to give it to). 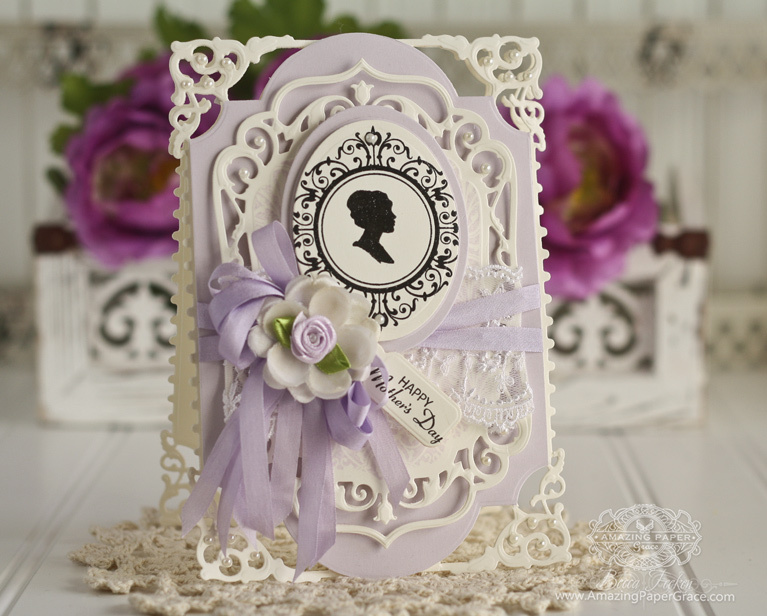 Such a beautiful and romantic card with the soft colours! Such a pretty card, Becca. So sorry you’re still under the weather. Do hope you pick up quickly and are soon firing on all cylinders. A sure sign of spring on the way in the UK, is the appearance of daffodils. We have snowdrops first in January/February, crocuses next in February and then daffodils in March. But this year we had daffodils out in January, before even the first snowdrop dared show its head!! I can’t ever remember this happening before! The sight of the first spring flowers coupled with the lengthening days draws me outside and raises the spirits! Another stunning card Becca. I totally enjoyed your video and I got to watch the other one on the hinged card as well. Great work. Oh how i wish i had found your blog 19months ago when i could have still made this beautiful card for my Mum and now she will only see it if she is looking down. My Mum loved anything that we made for her as i found when clearing out our home as she had cards that my twin brother Jim and I had made her oh so many years previous. She loved beautiful things but didn’t envy what she didn’t have but she was like your card, so delicate and soft looking but had the stamina of 10 men and a boy if it came down to it. Thank you Becca for showing us this piece of beauty and since our Mothers day is in a few days time i think i will make this for Mum and place it at the cemetery with her flowers. For me the first notion of spring is seeing the wee bulbs starting to poke their heads through the ground to see what is above that they are missing. The nights getting lighter and it being 5:30 or so pm before needing to shut the curtains and put on the lights. These for me are they signs of new life stirring into a softer, warmer day with the sun coming out to shine even when the temperature is still at freezing and below. I hope that you have a lovely day flower and that you are feeling stronger and better with each passing hour that goes by. Hi Becca. This is such a beautiful card and yes it certainly feels like spring. The video is awesome…what a fantastic idea!!! I hope you are feeling better real soon. My beautiful card arrived in the mail and I feel blessed to own one of your gorgeous creations. THANK YOU. When the days get longer and the forsythia bloom, I know Spring is in the air. It inspires me to get outdoors and just enjoy everything that is beginning to bloom. Morning Becca, Just watched your video, this is a fantastic idea using measuring spoons, and it creates beautiful petals and flowers, Genius !! I love your card, so beautiful and elegant. The first signs of spring, to me, are when the crocus and daffodils show their heads through the soil, and it is something I yearn for (I’m not a Winter person haha). It is so inspiring that yesterday afternoon I cut my front grass and did all my borders and my hubby ‘forked’ the grass afterwards and brushed up. We were both feeling our age afterwards, and both our backs were complaining bitterly, but the front garden looks lovely and has benefited from our hard work, which gives us satisfaction. Oh, I love getting tips on how to use common things in crafting that make it easier and better!! Thanks – They’re sooo beautiful!! Always love your how-to videos and aren’t you the clever one using measuring spoons to shape these flowers. Such a fabulous idea and I am in luck. I have that exact set and they are not my favorites to use in the kitchen so I can easily donate them to my crafts. I always know when spring is nearing when all of the wildlife comes alive. You start seeing all the rabbits, squirrels, birds and butterflies and even the coyotes doing their happy dances in the early mornings. And at night the owls are doing their mating calls. It is also time to get out into the garden and de-weed and prep for spring planting. I just throw on my shorts grab my gardening tools and a nice mug of tea and head out their in the early morning to do all my gardening chores while watching nature at it finest. Love your card as always. The first sign that I realize that Spring is nearing is when it’s 5:00 in the evening and still daylight. I get a happy feeling and just want to clean off my deck in preparation. Thank you Becca for the video…I’ve already made some flowers and they came out beautiful. I’m so glad you are a little better. The flowers are gorgeous! And so easy to make. I will be trying to make my version with what I have. Thank you so much for all your hard work and for sharing. Stunning card and that video WOW! Quick flowers, how amazing, I must go and buy myself a set of measuring spoons lol! Thank you so much for sharing this. I hope this finds you well as I have not been on my blog for a while, had so much work to do. Spring has arrived here in Arizona when the temperature reaches 80 and the trees are blooming. I love Spring!